Ahead of the five year anniversary of the financial crisis the American Action Forum (@AAF) released a report detailing the Federal Reserve’s response to the financial crisis. 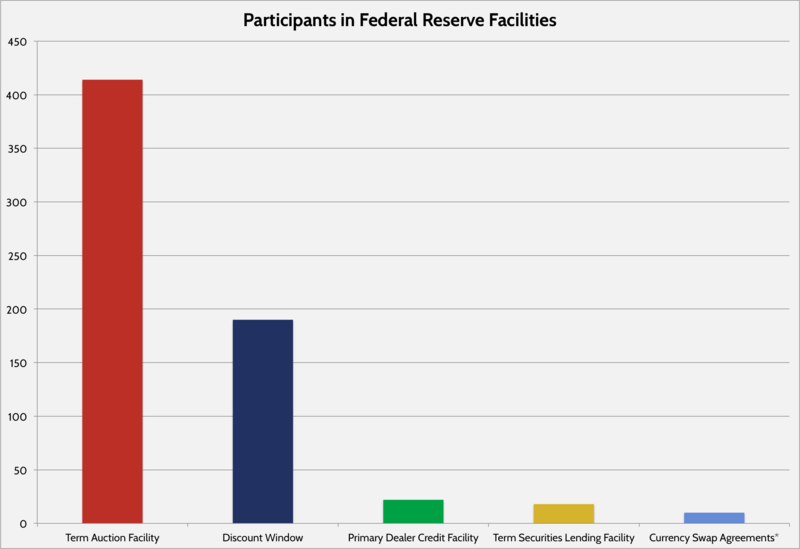 In attempts to stabilize the economy, the Federal Reserve created 12 programs and facilities to inject liquidity and support financial markets. The AAF report found that for the most part the Fed acted to provide liquidity to entire sectors of the financial system, as well as stabilize certain credit instruments, rather than target particular institutions. In addition to the paper, AAF is hosting a panel discussion on the financial crisis tomorrow. The panel will include former Financial Services Committee Chairman Barney Frank, AAF President Douglas Holtz-Eakin, and former Ways and Means Chairman Bill Thomas. To RSVP for the event click here. To read the paper on the actions by the Federal Reserve click here. * Participants in the Fed's Currency Swap Agreements program are foreign central banks.